I make lots of different noodle dishes depending on the ingredients that are in the cupboard and the type of noodle I have. Throughout Asia, noodle dishes are served as a quick and satisfying meal, the noodles replacing rice as the main carbohydrate. At my local market there are flat rice noodles from Vietnam, Hokkein noodles from China and rice stick noodles from Thailand to name only a few. One of the most famous noodle dishes is Pad Thai, this dish from Thailand is now popular worldwide. 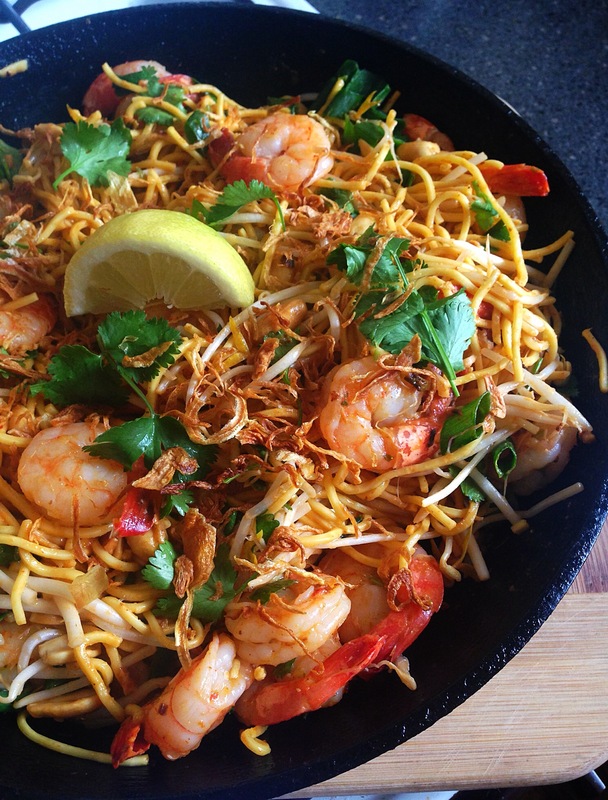 Generally made with rice stick noodles and including fried tofu along with the prawns, I made this version using Singapore noodles as I had some in the fridge. The fried tofu I had was unfortunately past its best so I omitted that but the result was still very tasty. Here’s what I made. Prepare noodles according to directions on packet. Drain and set aside. Mix together the chilli sauce, peanut butter, soy sauce and a little water to thin. Set aside. Heat oil in a wok or large pan and fry the white parts of the spring onion, the coriander root, the ginger, the garlic and the red capsicum gently. Add the prawns and fry until they become translucent and have changed colour. Pour in the sauce and toss, then add the noodles, chard, bean shoots, fresh coriander leaves, peanuts and green parts of the spring onion. Toss well to mix the ingredients. Serve immediately garnished with more fresh coriander, fried shallots and lemon or lime wedges.